The paints are reportedly intended for airbrush use but have a surprisingly thick viscosity. They come in Vallejo's familiar plastic 'eye-dropper' bottles in an attractive carton featuring a colour photograph of a restored Ki-43 Hayabusa in flight over chips of each paint colour which apart from the aotake are pretty close to their actual appearance, a guide with profiles (shown below) and a brief explanation of the usage of each colour with FS 595 equivalents. Inside the box is a folded leaflet showing the Vallejo paint range. 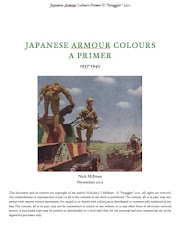 The first point to note is that some of the Vallejo colour descriptions do not correspond to any official paint colour designations in the IJA KôKaku 39 colour standards. 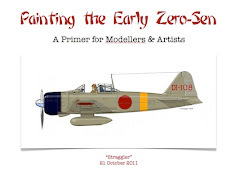 This makes it more difficult to reconcile them without direct comparisons and tends to perpetuate the imprecise understanding of the colours fostered by previous hobby paint ranges. The second point to note is that this is a preliminary visual and subjective appraisal of painted out samples which have not yet been measured for their precise colour values and it does not take into account any long term curing and colour shift of the paints. There may be updates! A commentary on each paint colour follows. 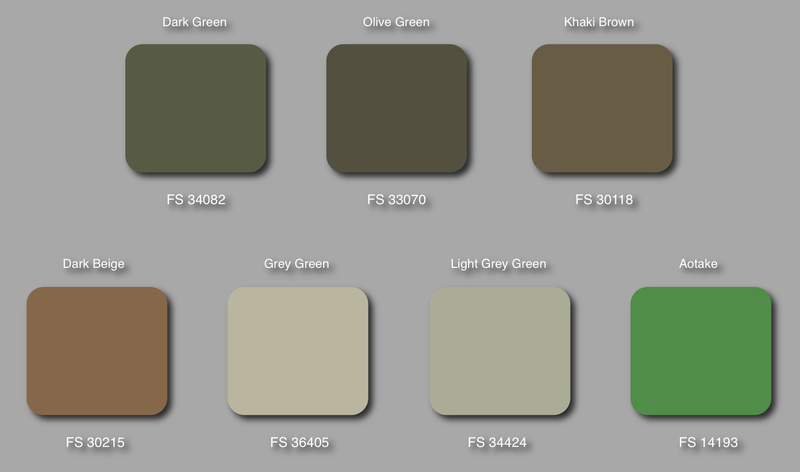 IJA Dark Green AV71285 - This is similar to the generic IJA Greens in other paint ranges and is compared by Vallejo to FS 34082 which appears lighter and greener. It is a dark, dull olive green and not typical of the stronger greens offered in other paint ranges to represent the so-called 'Nakajima Green' for example. It approximates # 22 Noh Ryoku Shoku (濃緑色 - deep green colour), but is a little lighter. Probably more useful as a variant of the late war IJA # 7 as applied to some Kawasaki types. IJA Olive Green AV71286 - This is meant to represent the late war # 7 olive drab colour and is compared to FS 33070. It is darker and slightly more brownish than the Dark Green AV71285 but slightly greener than FS 33070. It has a good richness of hue. IJA Khaki Brown AV71287 - This is described as another late-war colour and compared to FS 30118, although it is slightly darker and more greenish. It is similar to the late-war factory paint, a variant of # 7, recorded by Noboru Shimoune as applied to Mitsubishi aircraft like the Ki-67 and Ki-46-III. "This colour was used in conjunction with deep-green as a camouflage scheme at the beginning of WWII. Many of the Nakajima Ki-43 "Hayabusa" (Oscar) and Nakajima Ki-44 "Shoki" (Tojo) were camouflaged in this two tone scheme or simply spotted with the deep green over the brown." 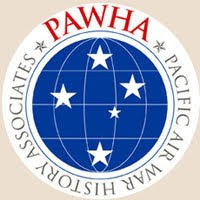 "This colour was used on aircraft over the China front. It resembles the colour of the ground surrounding the Yellow River in northern China. It was yellow tinged with tea colour." Not really typical of the official IJA colour standards for browns which do not use the term "beige" (katakana: ベージュ beeju), dark or otherwise, but similar to many artistic depictions. It has an appearance between the 'orange-brown' of # 33 Kaki iro (柿色 - persimmon or shingle colour) and the dark earth of # 31 Cha Kasshoku (茶褐色 - ‘tea’ brown colour, dark reddish-brown or liver colour), closer to the former than the latter. Therefore it perhaps has a certain hybrid/generic usefulness as a simplification to avoid head scratching when pondering black and white images to decide which brown! "More tea, vicar?" IJA Grey Green AV71326 - This is a distinctly creamy or brownish grey which is compared to FS 36405 and is similar to the late-war factory applied under surface paint on types like the Tachikawa-built Ki-43-III Ko and Nakajima Hayate. It would also be useful to represent the creamy grey reported on some Ki-27 training aircraft. The Vallejo paint is just slightly more brownish than 36405. 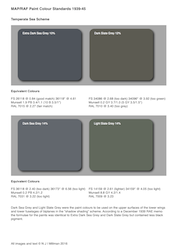 IJA Light Grey Green AV71321 - This is similar to generic IJA Grey Greens in other paint ranges and is compared to FS 34424. 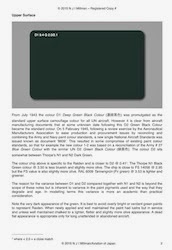 It is close to the first paint chip in Model Art 329 which is described as hai ryoku shoku (灰緑色 ash green colour), but more greenish than the # 1 colour standard for that colour and as the FS equivalent suggests, similar to the RAF colour Sky. The IJA colour standard sits more typically between the two Vallejo colours so there is an opportunity to mix them to achieve different effects. Neither of the grey greens in the set represents the more blueish-grey colour seen on some Army types. AOTAKE Translucent Green AV71417 - This is a surprisingly bright emerald green colour and not typical of the more subtle blue or blue-green hues of real aotake. No FS equivalent is given but it is similar in appearance to FS 14193. It is the only colour which does not look similar to the chip shown on the box. Probably the least useful colour in the set. Aluminium AV71062 - This is a bright aluminium somewhat between a polished and oxidised natural metal finish. Impressive for an acrylic paint. Like the curate's egg this paint set is good in parts and worth considering for those who like to use acrylics and find Vallejo paints suited to their use. I found it potentially more useful than expected after seeing the colour descriptions and before being able to examine the actual paints. The colours have an attractively subtle and sombre "military" quality that should look good on models in contrast to the brighter national and unit insignia. It is a pity that the designers strayed from official designations and that the aotake and aluminium colours were included in preference to some arguably more useful camouflage colours such as # 21 or # 30. In the UK the cost of the set works out at about £2.30 per paint bottle but I don't know if the paints are yet available separately or will be. The appraisal set was purchased from Everything Airbrush (The Spraygun Company Ltd) in Poole, Dorset. Appraisals of the Vallejo IJN and AK Interactive IJN sets to follow. . .
Update: In respect to issues of viscosity and application Ken Glass has since kindly provided the helpful advice that Vallejo Thinned Medium VJ70.524 will ease brush painting and improve levelling. Interesting comment about the consistency of the paint. I find Vallejo and the other Spanish brands all over the place in viscosity and usability, even from bottle to bottle. I love the idea of these various acrylics as my paint bins show, but in practice.... hard to beat lacquers and enamels. Yes, my LHS has a few of the large Vallejo racks and trying to decipher what paint is supposed to be a specific J-camouflage color is maddening. The paints themselves spray quite well through my Iwata airbrush, but are relatively fragile until they get clear coated prior to weathering. I prefer them for painting vehicles, and still like either Gunze Mr. Color, or Tamiya thinned with Mr. Color thinner for aircraft so I can wet sand prior to decals. I have used these colors for the first time on my current Hayabusa project with mixed results/emotions. I had great results with their MetalColor line on my Ka 14 project which led me to foolishly treat these in the same way without testing first - never a good idea and I only have myself to blame. The Vallejo Grey Primer is a poor choice for disclosing where corrections are needed as it cannot, in my limited experience with it , be sanded . It also has next to no adhesion to the plastic itself and so defies feathering hard edges as it just rolls away like a skin . Thankfully another modeler recommended denatured alcohol- edges can be eased with a cotton swab moistened with it. On the positive side it is very good at not obscuring detail and the convenience of the dropper bottles and lack of noxious fumes is certainly a plus. 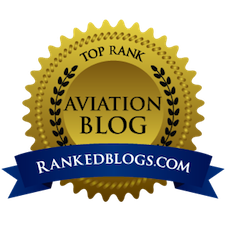 All of this heartache is detailed in my build log on Aeroscale which , when completed, I will provide Aviation of Japan with photos/ links . I like how it sprays, blends, and the clean up. But yes, there isn't any comparison to a lacquer or enamel. Vallejo Airbush cleaner is probably the best thinning medium for airbrushing the Vallejo colours. If you gents are looking for good water-soluble and not-smelly primers, look for Badger Stynylrez, UMP Primer or MiG One Shot primers - the same Badger formula repackaged - they cover and self-level well, don't obscure the details and can be sanded. Vedran- Thanks for info - I will definitely give those primers a try . On the thinning issue did you mean Vallejo Airbrush Thinner or do you actually use Cleaner for thinning paint ? I have both but only use the cleaner for cleaning . I use the Vallejo Airbrush Cleaner for both thinning the paint for airbrushing and later cleanup. I never use it to thin the paint in the bottle, it would probably destroy it. This was an reccomendation on several websites (and IIRC by the manufacturer)when at first the problems with airbrushing and tip dry were reported.